Engineering students tackle and solve problems that challenge their real-life clients every day. A stranger entering the Sheridan Road entrance of the glassy, “green-friendly” Ford Motor Company Engineering Design Center quickly realizes that the ivory tower has gone the way of the manual typewriter. What truly sets the six-story building apart from other academic buildings is more than its high proportion of natural light and three-story atrium. It’s the worker bee activity in the shop room, one floor below street level but easily visible from the main floor. Students wearing goggles operate lathes, milling machines, band saws and drill presses. They use hand tools, precision knives and glue guns. They measure, cut, shape, puncture and hammer raw materials into products designed to have real-world usefulness for clients, often those with disabilities. In a scene right out of the movie Ferris Bueller’s Day Off, a male student is casting a fishing pole in the café area overlooking the shop floor. Is he getting an early jump on his summer vacation? No, he’s doing what an engineer does best, trying to solve a problem to help people. In this case the client is an avid bass fisherman who wants to continue the sport after losing both arms in an accident. And the student is fishing for the right approach. How do you adapt the rod and reel to someone who won’t feel the tug of the fish? Would it be better to fish with or without prosthetic arms? Can feet be used instead of hands for casting and reeling? Students at the McCormick School of Engineering and Applied Science learn technical skills through such projects. But from freshman year on they also get to understand what it’s like to be an engineer by writing reports and proposals, using visual communications, working in teams and empathizing with clients. 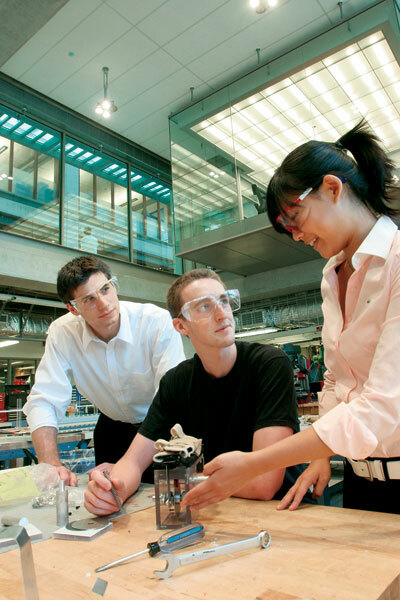 These skills are all part of the first-year Engineering Design and Communication (EDC) course sequence. Steve Jacobson, a design and prototyping specialist, works on the nitty gritty of design problems with the students and tries to keep both the students and the machines in good working order. First-year EDC projects are frequently done in collaboration with the Rehabilitation Institute of Chicago and other nonprofits and corporations. RIC and McCormick have developed a close working relationship in recent years, including sharing faculty and developing new design products. Projects include wheelchair seatbelts for elderly or acute-care patients, an adaptive dog leash to help stroke survivors and adaptive downhill skiing poles. Project proposals often come from nonprofit organizations and individuals. For example, the National Lekotek Center in Evanston asked engineering students to create a Sensamat — a toy consisting of a large piece of soft Velcro and adjoining shapes that feature various textures for tactile stimulation — for children with autism. Another RIC project involved a young woman who lost both of her arms after contracting bacterial meningitis. Fitted with prostheses, she wanted a way to keep her long hair in a ponytail while playing volleyball. 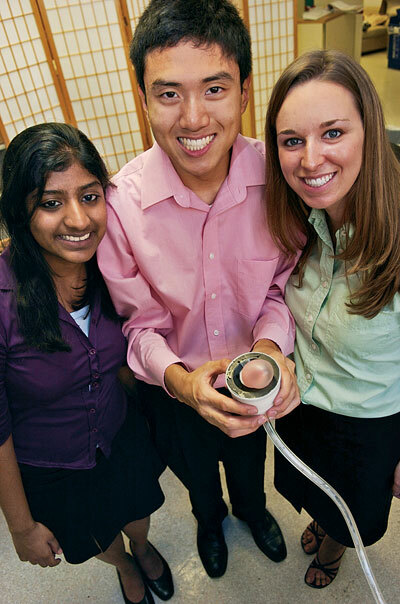 Northwestern students helped design a loop device allowing her to do the ponytail herself. Engineering students also helped the RIC Cubs, a wheelchair softball team sponsored by the Chicago Cubs, get to first base faster and hit the ball harder. Players, who use a 16-inch softball, would find themselves swirling around too much while batting. 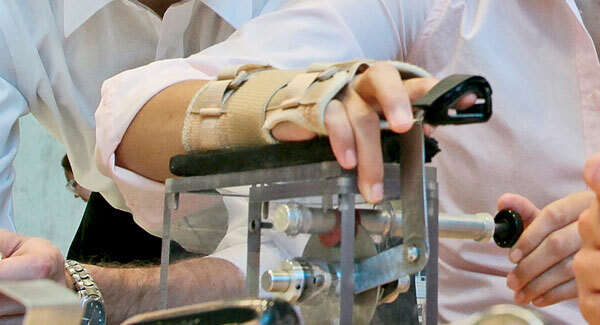 The students developed removable blocks to stabilize the wheelchairs. This innovation helped the RIC Cubs win a national title. A glass bridge connects the venerable and fortress-like Technological Institute to the sleek and modern Design Center, but in reality, bridges are being built in every direction, across disciplines and between academia and the outside world to help better train tomorrow’s engineers. Students, faculty and administrators are asking some important basic questions: What does it mean to be an engineer in today’s global marketplace? What new skills do engineers need to succeed? Technical skills are a given, but what about ethics? Engineering schools are battling a declining interest in science and math and refuting stereotypes about what engineers actually do. Many are starting community-oriented programs to make engineering more visible. McCormick Dean Julio Ottino says, “Today’s engineering graduates are just as likely to build careers in the service industries — health, consulting, law, business, information technology — as in traditional engineering manufacturing jobs. Part of that broad educational background includes EDC, launched as a pilot program in 1996 and now a required two-quarter sequence of courses for all engineering students their freshman year. Part of Engineering First — which introduces students to engineering concepts in order to do design — the courses are designed and taught by faculty from both the engineering school and the Weinberg College of Arts and Sciences Writing Program. 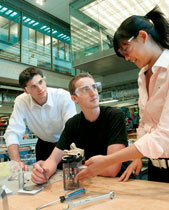 The Writing Program faculty offer skills to help engineers to communicate effectively. Hirsch says teaching design and teaching writing are similar. Both involve brainstorming and concept generation, audience or user testing, iteration and striving for constant improvement. “When you’re teaching writing, you’re teaching a type of design,” she says. As a first-year student Hammock worked on Team Super Bubble, a project to “develop bubble gums that blow larger bubbles than those currently on the market,” according to the team’s June 2006 report. The trick is to come up with consistent testing procedures for a bubble gum–blowing machine and for “live” human testers. 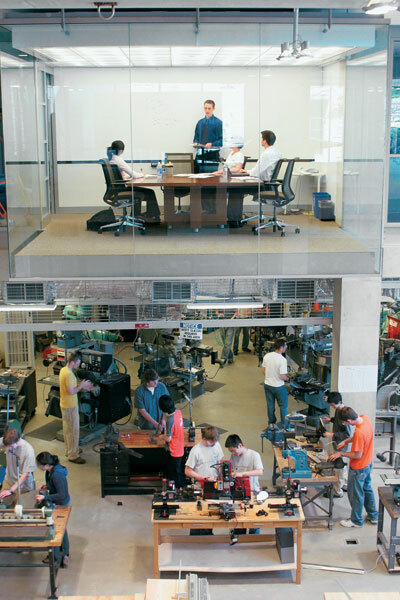 EDC is part of Northwestern’s Institute for Design Engineering and Applications, which aims to educate world-class design engineers by combining creativity with engineering rigor, working in cross-disciplinary teams and communicating effectively to diverse audiences. It also helps students create engineering design portfolios that reflect on their undergraduate work and showcase their abilities. For instance, the McCormick-sponsored Engineers for a Sustainable World’s Solar Recharge team worked on a project in the isolated village of Santo Domingo, Panama, to help small-scale ranchers protect their cattle from wild animal attacks. The village does not have electric lines, but with help from a local nonprofit, ranchers deployed electric fencing systems powered by car batteries. However, the batteries must be recharged in Panama City, a costly and time-consuming process for the ranchers. The Northwestern team is designing and will help implement solar power systems for the ranchers. These practical design projects and experiences are part of a bigger plan. RIC medical director Elliot Roth takes a visitor on a tour of the 18-story institute located amid other Northwestern buildings in downtown Chicago. The RIC is a hospital, a rehab center, a home for several specialized clinics, a collection of community outreach programs and an advanced medical research center rolled into one building. Well beyond the work with softball teams and ponytails, Northwestern’s collaboration between engineering and medical research is beginning to offer devices that will help patients for years to come. For instance, the NÜberwalker project, which has been developed by successive teams of IDEA students since 2003, recently received the da Vinci Award from the Michigan Chapter of the National Multiple Sclerosis Society for innovations in helping people with disabilities. The NÜberwalker, a project developed with RIC and supported by a federal grant from the U.S. National Institute on Disability and Rehabilitation Research, is a body-weight supported treadmill training system that can be used with in-home rehabilitation for patients with spinal cord injuries or other gait disabilities. Its frame is placed over the treadmill and supports the body weight through a system of bungee cords tensioned by a motor. Another federally funded joint project with the RIC involves developing a finger trainer for stroke survivors and other patients. Therapy allows patients to develop gross motor skills, but many want to redevelop typing, writing and sewing skills. Therapists need a device that stroke survivors can use at home to continue strengthening their fingers between therapy sessions. He hopes to have a prototype ready for patient testing in the current academic year. NÜberwalkers and finger trainers and all the other joint projects between McCormick and RIC leave even close observers amazed at the progress and breathless in anticipation of what might come next. But one thing is clear: The relationships that have been built between the students and rehabilitation clients are already paying dividends. The students learned to listen to the clients during the design process and go back to the drawing board to improve the products to better meet client needs. No one is more surprised by these results than Roth. “Frankly, all I thought I was doing was getting them to think about rehabilitation and disability,” says Roth. The practical products developed as a result of this collaboration are an unintended benefit for everyone. Dan Cattau is a Chicago-area freelance writer.